Very pleased with this kettle, very stylish and works well thank you. I have had it only for a few weeks and am very happy with its performance. As far as cleaning and durability are concerned – i cannot tell as i have had it for such a short time. Very good item, accurate ,well designed. Any setting under 100 c degrees will not send steam out underneath my upper kitchen cupboards. The coffee setting is 95c and is perfect. 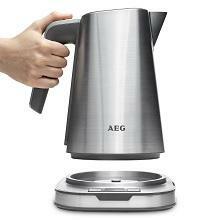 The kettle looks great and matches other aeg appliances we have. It’s quick to boil and the one cup feature is handy. It does seem quite loud as the boil completes but no more than other kettles we’ve had. Excellent product that looks amazing and works really well. 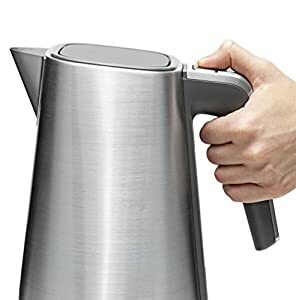 Love this kettle, it’s heats quickly enough and quietly but beeps when it’s boiled so handy if you are out of the room and might forget what you were doing. Looks great and like the options for 1 cup boil etc. Excellent quality, very useful to be able to adjust temperatures. Make yourself a lovely cuppa, and have some cheese too. The external casing is as hot as the boiling contents. Nice kettle but check it before you use it! 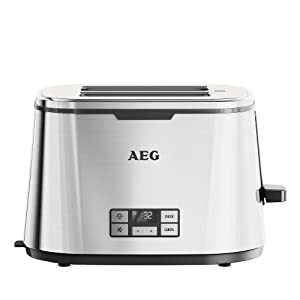 Product Description, The AEG 7 series EWA7800 digital kettle is suitable for any type of kitchen. It’s digital temperature control and real-time temperature indicator functions give you full control of your tea temperature. 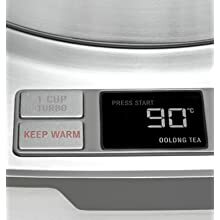 The One cup turbo function boils one cup of water in less than 60 seconds and the intuitive programmable high contrast LCD display makes it quick and easy to use. Whether it’s tea for two or an afternoon tea party – the 7 series water kettle has you covered with 1.7 L of capacity. Note: UK customers do NOT need to register for the warranty as they automatically get the 24 month warranty. It is only the EU customers who have to register. 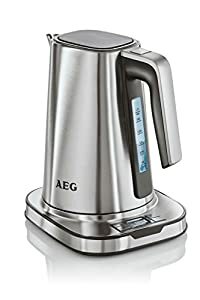 Enjoy the speed, ease and control of this 1.7 L water kettle, with functions like the digital temperature control, real-time temperature indicator, OneCup Turbo and intuitive programmable high contrast LCD display. With smart features and a good design, the 7 series range by AEG is designed to inspire simply optimum results in your kitchen. 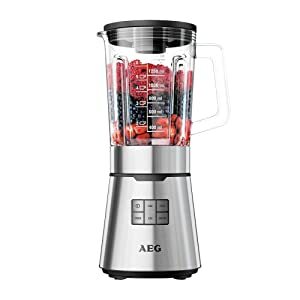 Each of the small kitchen appliances comes with sleek, seamless design and intuitive controls – so you can get the best results out of your everyday food and drinks. With eight programmable temperature settings, you can enjoy your tea the way it’s meant to be: 50, 60, 70, 80, 85, 90, 95 and 100 degree Celsius. 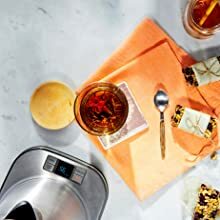 For each single kind of use, is it black tea, herbal tea, French press coffee or even baby food, this kettle can provide you the right temperature. 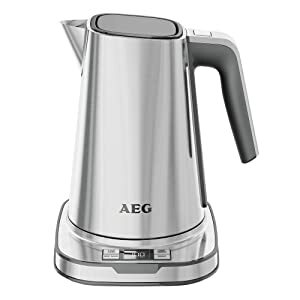 Whether you’re making tea for just the two of you or a Sunday afternoon tea party – the AEG Premium 7 Series water kettle has you covered with 1.7 L of capacity. Large enough to fill a pan full of water for pasta or soups. Don’t worry, be safe. Because this water kettle has automatic shut-off in three ways: When the water is boiling, when you lift the kettle from the heating station and when there is no more water left in the kettle, thanks to the integrated Boil-Dry protection. For the real tea lovers we have three different tea-settings in their high contrast LCD Display. 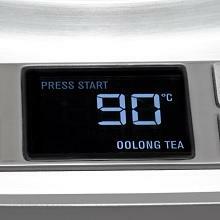 The right temperature for Oolong tea (90 degree Celsius), White tea (85 degree Celsius) and Green tea (80 degree Celsius) are pre-programmed and accessed at the touch of a button. With just one touch the lid of the kettle will open. The opening is so big that it is easy to clean the innerside of the kettle. 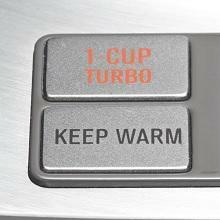 If you need to be fast, simply use the OneCup Turbo function. It boils 200 ml water in less than 60 seconds. A good choice when you just want one cup all to yourself. 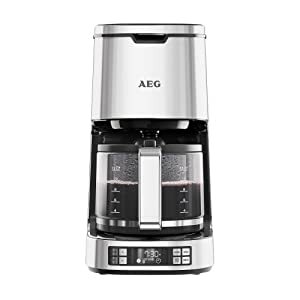 The design of the AEG Premium 7 Series expresses pure quality on your kitchen countertop. This premiumline exists out of different products and is made from stainless steel. The Keep Warm function will keep the temperature for 40 minutes. So later on you can still use the water for a nice cup of tea. You don’t only save time but also energy, because the water doesn’t need to be warmed up again. 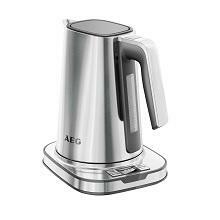 With smart features and design, the 7 series range by AEG is designed to inspire simply optimum results in your kitchen. 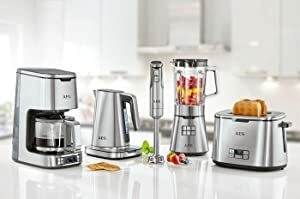 Each of the small kitchen appliances comes with sleek, seamless design and intuitive, modern controls – so you can get the best results out of your everyday food and drinks. Below you will find the other products that complete the AEG 7 Series premium range. A good sturdy kettle with flimsy plastic lid which doesn’t open. Seems to take ages to boil when filled,but one cup tubo is ok. Also very annoying very loud beeping when boiled. Would not buy this at full price. Great product ideal for tea lovers the perfect cuppa at the perfect temperature. Excellent kettle light and fast boil. Excessively loud confirmation beeps. Seems to scale up very quickly. Works perfectly, comes to the boil quickly and looks lovely & easy to clean. I had to return two of these before getting one that wasn’t scratched or marked which was really frustrating. If you’re buying, make sure you give it a good going over before using it as the metal and handle in particular was scratched on my first two. 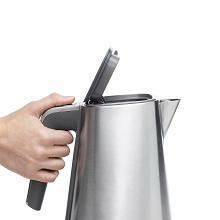 Once you’ve got a good one, it’s a stylish kettle, lightweight and easy to use. It boils fairly quickly, not noticeably quicker than most though. 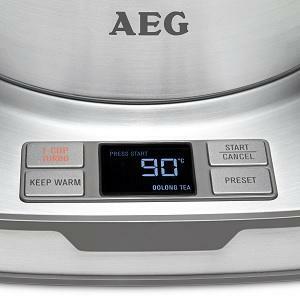 Like the digital keep warm and rapid boil functionality. Overall, pleased with the purchase. Fast and love the options for different beverages. We’ve been through two others in just over a year and decided to invest in this. It looks great, is lightweight to lift and the preset temperature settings are really useful, as is the temperature display. 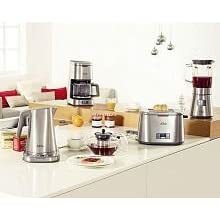 Excellent kettle, very fast and efficient, quality. Based on my sons experience & mine for a short period only the kettle is first class. The only areas which could be improved are :- the aperture for adding water is quite small. The handle partially blocks the view of the filling scale whilst adding water. One has to be careful when holding the handle to avoid touching the very hot casing of the unit. The best kettle i ever possessed. Very contemporary & robust design, handy features, quick boiling and hold more than enough water. It also shows the water temperatures when it is boiling- a cool feature my kids love. Great product, good looking and very useful temperature adjust.